John G. Alden, Naval Arcitects, Boston , Mass. 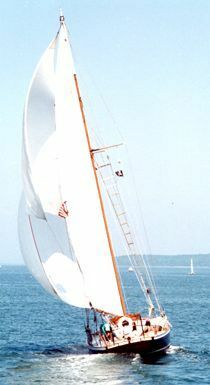 Built: in 1930, and delivered: “on or before July 4” according to terms of Armes contract with Alden. Spars: Sitka and western pine. 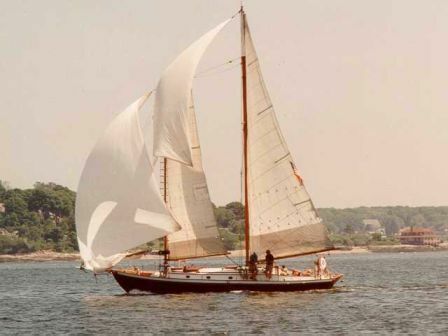 Standing rigging and fasteners: original galvanized iron fastners restored silicon bronze. Rigging still galvanized wire rope. Galley forward. Owner’s enclosed stateroom port, main cabin sliding and hanging berths port, settee and quarter berth to starboard, with mahogany chest of drawers and hanging closet to port. Head amidships starboard. Pipe berth in foc’sl. Five hatches for ventilation and two for engine room access. Running backstays for holding onto when needed.